If you are in South Korea that is. Samsung has release flip phones to the South Korean market to cater to those who “respected old generation”. The phones are equipped with 2G and 3G recievers (sorry no 4G for you LTE folk) FM radios, 3 inch screen, and super awesome faux leather for a professional Samsung look. This phone is NOT android powered. It has a 3MP camera and a 1,000mAh battery and its speakers go to about 70db. 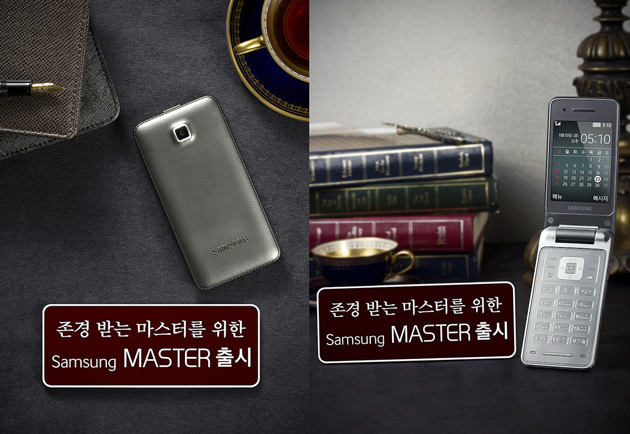 Officially called the “Samsung Master” line, it will cost you around 240,000 won or about $235 USD. The phone measures 112.5 x 57.5 x 14.8mm when closed and is available in Metallic silver and Montblanc Black at launch with Wine Red coming soon. I personally like a flip phone over the now standard tablet in my pocket style phone. Which is probably why I have a case that flips. And it seems like other people do also. China has a growing line of flip phones being released by Samsung. I wonder how long till they make their way back over to this side of the world that is more than just the puny T159. Can you say which ones? the link checker plugin doesn’t find any and I can’t see any either.